The allure of a refined San Francisco wedding has been leading engaged couples through the front doors of the Westin St. Francis Hotel for over a century. As one of the city's most revered landmark hotels, the Westin St. Francis is the only hotel that can boast a union square address. The energy you encounter as you pass through the grand lobby sets the tone for the evening's festivities. The Imperial Floor, located 32 stories above a bustling union square, is situated slightly above the famed downtown skyline. The panoramic views of the city that come into view as they ascend to the 32nd floor will take your guests' breath away. The Imperial Floor has two gorgeous reception facilities, the Victor and the Alexandria, who share the same stunning view. The grand hotel recently refreshed the spaces to assure that the interior decor rivals the panoramic bay and city views. 'Sophistication meets Hollywood glamor' is the best way to describe the truly elegant venue. The detail that has been put into the refreshed design is captivating. From the light fixtures to the opulent window coverings, the new furniture and accessories are best described as beau arts meets SF Moma. 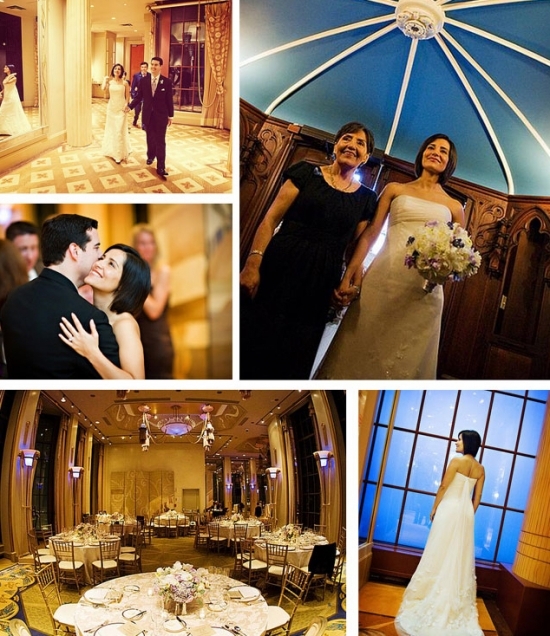 With any ballroom wedding, you'll want to bring out the beauty and detail of the venue. Creams, golds, and blush hues work beautifully in this environment. The rooms will look as if they are constantly awash with the warm glow of candle light.